Las Vegas Pharmacy has more than a decade of dedicated experience with lien clients. Our team works with physician practices and personal injury firms to streamline the lien prescription process. For additional convenience, we created a network of partner pharmacies to serve clients closer to home and reduce wait times. 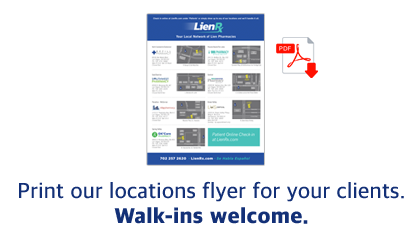 Lien Rx offers seven walk-in locations from Summerlin to Green Valley including Las Vegas Pharmacy as the management hub of operations. One contact team for your firm, seven pharmacies for your clients to choose from. To expedite new client service use our online check-in system.